There is no doubt that the mainstay of treating skin cancer is to surgically remove it. Dr Con Pappas has received a high level of training and endeavours to achieve a good cosmetic result without compromising cure of the tumour at hand. This is performed under local anaesthetic and most cases just require simple side to side closure with sutures. When this is done a margin of normal tissue also removed as well to make sure that all the cancer is removed. This is then sent to the laboratory and tested for accurate diagnosis and to confirm completeness of removal. Thankfully these are uncommon but can occur and need to be mentioned. This is performed under local anaesthesia for suitable small lesions typically BCC and Bowens that are firstly shaved and curetted with a sharp instrument and then cauterized and then heal without sutures the wound kept moist with Vaseline. This is usually done on non-cosmetic areas typically the back. In some cases simple side to side closure is not possible either because of size or anatomical position. In these cases a flap or a graft repair is required to close. Flaps involve moving tissue on a from the surrounding area to close the defect while it still maintains a blood supply through a pedicle or base of the flap. This way it heals quickly like a normal wound. Grafts involve taking detached tissue from a specified donor site and placing onto the recipient site. As this needs to establish a new blood supply healing is typically slower. 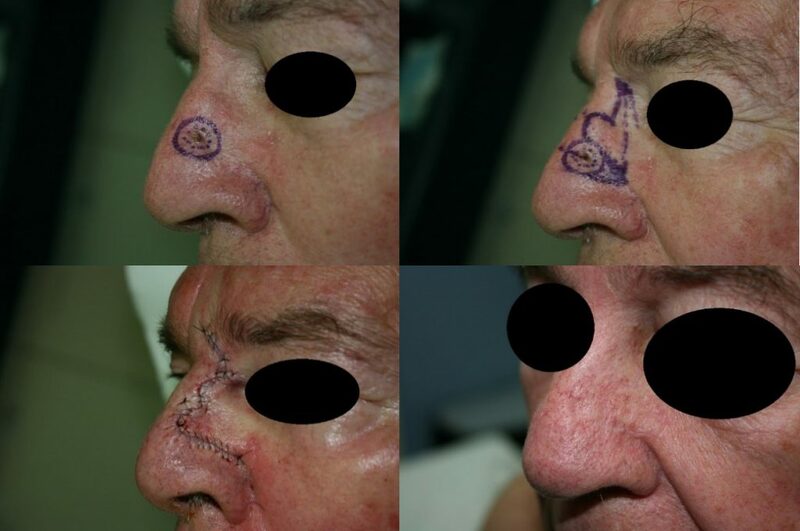 Basal cell carcinoma removed from nose -bilobed flap. 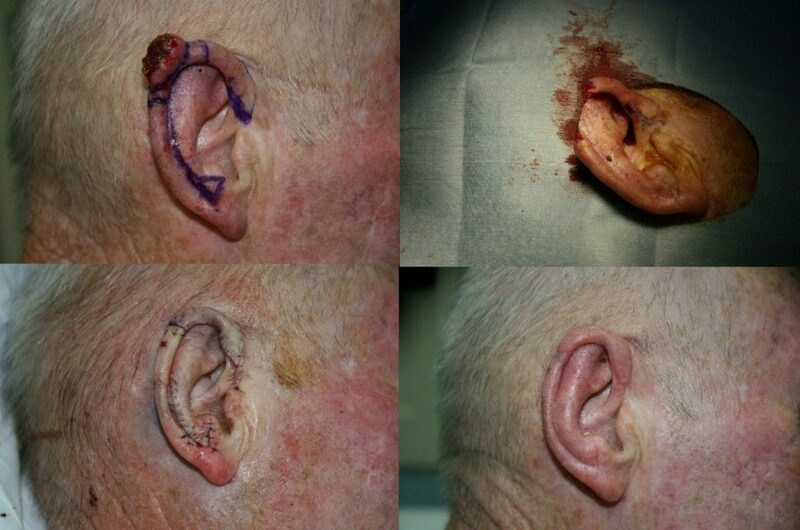 Squamous cell carcinoma removed from the ear-Antia -Buch Flap. Squamous cell carcinoma of the lip treated by wedge excision. Intravenous sedation anaesthesia is offered to patients on Dr Pappas regular operating list at Ulladulla Endoscopy day centre.